Using both David Bowie and a second actor as Jareth, Jim shot the challenging Labyrinth scene featuring the song “Within You”. Bowie’s character Jareth taunts Sarah (Jennifer Connelly) as she tries to get to her brother Toby (Toby Froud) in an elaborate set inspired by the art of Dutch artist and illustrator M.C. Escher. Jim was intrigued by Escher’s images of seemingly impossible architecture where stairs seemed to lead both up and down at the same time. The inability of the viewer to recognize what is and is not real was a theme the permeated some of Jim’s experimental works in the 1960s and was explored at length in the film. Production designer Elliot Scott’s concepts coupled with the effects team’s work and Jim’s direction brought Escher’s ideas into three-dimensions and added to the other-worldliness of the imaginary world. 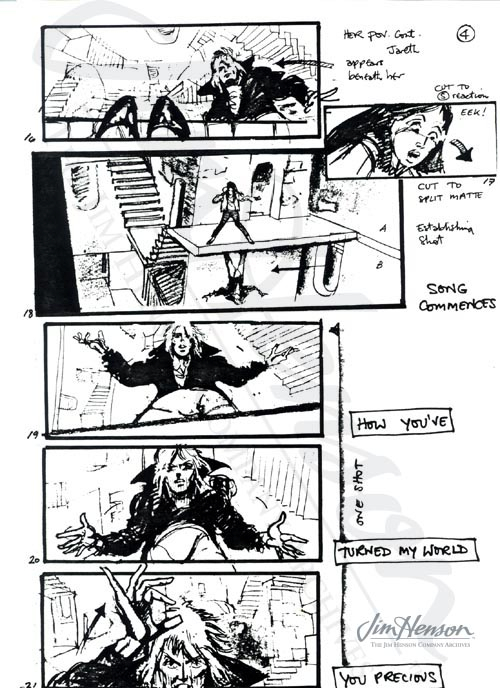 See how they did it in a scene from the “making of” documentary, Inside the Labyrinth. Eliot Scott’s production design for the Escher scene in Labyrinth, 1985. 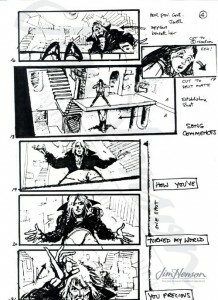 Storyboard page by Martin Asbury for the Escher scene from Labyrinth, 1985. This entry was posted in 06-June '85, 1985, Labyrinth and tagged David Bowie, Jareth, Jennifer Connelly, M.C. Escher, Sarah. Bookmark the permalink.